Part of what makes my job fun is stumbling across well-camouflaged nuggets, like this board here on Craigslist. It’s described as a “Vintage Surfboard by Bradley and White”, and while this is correct, this board is actually an old school White Owl noserider. If I had to guess – and I’m no expert – this particular White Owl board is from sometime in the 1960s. 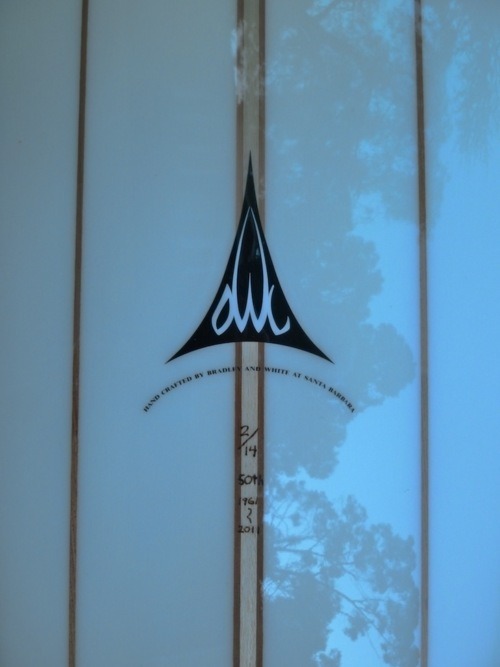 The logo on this board reads “Hand crafted by Bradley and White at Santa Barbara.” Stoked-n-Board doesn’t even show this logo on their page for White Owl. However, Andreini’s 50th anniversary boards clearly copy this unique text layout, as you can see here. I would also say the outline of the board looks like a pig, given that the wide point is behind center and the nose looks pulled in. More pics would help, though. The board is listed for $400. That seems extremely fair if the bottom is in as good shape as the deck, but that’s not always a guarantee. The listing indicates the board is watertight right now, which is always a good sign.